I am 28 years old, so my experience with gray hair is pretty limited. I HAVE found some on my head (to my shock and dismay) and had to face the rude awakening that apparently I am getting "older"... and by that I mean that it was clearly my vision that was failing me. I am a hair color-er (technical term), in that I like to have my hair colored. In doing so, I choose to go to a salon (because "ain't nobody have time for that"), pick colors similar to my natural hair color, and use semi-permanent color to ensure that fading and growing out happen simultaneously, plus, it adds a tremendous amount of shine. Most people despise their natural hair color - we can refer to this as being ungrateful (be thankful you have hair!) you-always-want-what-you-don't-have syndrome. Other individuals, namely my mother, suffer from a whole different situation. We can refer to it as a discrepancy between "natural" and "desired" hair color (AKA - gray coverage, sorry Mom!). For those not suffering from those pesky grays, you may suffer from your dreaded roots that seem to surface just weeks after you spent a fortune getting your hair colored, or the laboring task of coloring it yourself. Either way, I have your solution, and it is in the form of my latest review through Vocalpoint! Introducing: Clairol® Nice'n Easy Root Touch-Up! 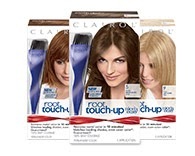 The Clairol® Nice'n Easy Root Touch-Up comes in 21 different shades that you can check out here, and retails for $5.99 per box. If you dye your hair from home on the regular, their Match Tool will even tell you which color to buy in order to match the color you currently use! That takes the fuss out of going to the store, searching around, holding boxes to your head (don't pretend like you haven't done that before), coming home, using it and finding out you should have gone a shade (or three) lighter/darker. What are you waiting for? Enter my giveaway below for a chance at winning a Free Clairol® Nice'n Easy Root Touch-Up coupons (they expire 12/31/2013)!